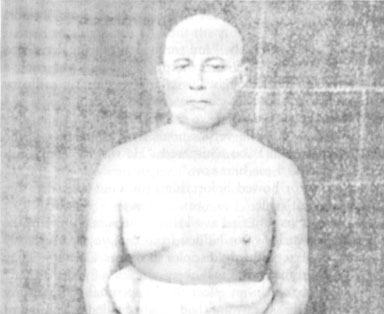 Swami Pranabananda, a fully realized disciple of Lahiri Mahasaya. I will tell you how priceless is a guru’s help. I used to meditate with another disciple for eight hours every night. We had to work at the railroad office during the day. Finding difficulty in carrying on my clerical duties, I desired to devote my whole time to God. For eight years I persevered, meditating half the night. I had wonderful results; tremendous spiritual perceptions illumined my mind. But a little veil always remained between me and the Infinite. Even with super-human earnestness, I found the final irrevocable union to be denied me. One evening I paid a visit to Lahiri Mahasaya and pleaded for his divine intercession. My importunities continued during the entire night. Immeasurably uplifted, I returned to my home. In meditation that night, the burning Goal of my life was achieved. Now I ceaselessly enjoy the spiritual pension. Never from that day has the Blissful Creator remained hidden from my eyes behind any screen of delusion. Some months later I returned to Lahiri Mahasaya and tried to thank him for his bestowal of the infinite gift. Then I mentioned another matter. The next day I made my application. The doctor inquired the grounds for my premature request. Without further questioning the physician recommended me highly for a pension, which I soon received. I know the divine will of Lahiri Mahasaya worked through the doctor and the railroad officials, including your father. Automatically they obeyed the great guru’s spiritual direction, and freed me for a life of unbroken communion with the Beloved.